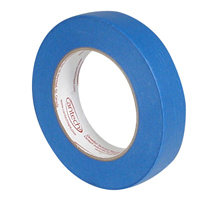 Cantech UV resistant masking tape is made with conformable blue crepe paper providing excellent UV resistance. Coated with a solvent acrylic rubber adhesive it is ideal for outdoor use on glass, wood, vinyl and metal surfaces. This high quality masking tape can be left up to 14 days leaving no stains or residue upon removal.